Although a diamond’s cut, clarity, color, and carat weight are the most important factors determining its appearance, the chosen setting can also have a significant impact on the presentation of the stone. Choosing the band and setting of a diamond engagement ring allows the wearer to create a custom look to complement their tastes, activity level, and hand size, as well as the shape of the loose diamond. 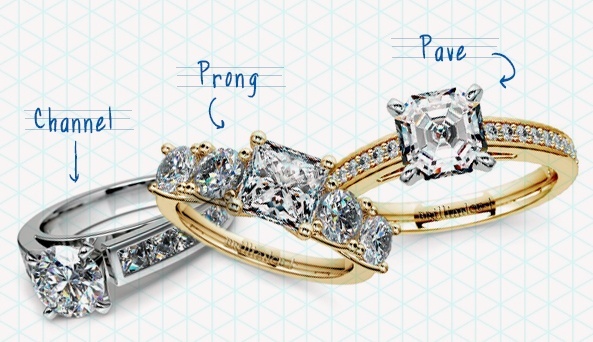 Prong Setting: This classic style is the most common option among today’s brides. The diamond is nestled in a metal basket and secured by three or more prongs. Because the diamond is exposed between the prongs, plenty of light is allowed to enter the stone, reflecting maximum sparkle and fire. Another advantage of prong settings is that the diamond can be easily accessed for cleaning. Most commonly used to mount solitaire loose diamonds, the prong setting is most effective for larger diamonds. It’s important to have a jeweler periodically inspect the prongs and tighten them as necessary. Bezel Setting: A popular choice for brides who prefer a sleek, contemporary look for their diamond engagement rings, the bezel setting secures the loose diamond with a metal “collar” that surrounds the stone. A full bezel wraps completely around the diamond, while a partial bezel leaves some sides of the stone open. While this style of setting runs the risk of overshadowing a smaller diamond, it’s renowned for its durability and smooth, upscale look. Bar Setting: Offering more durability than prongs but less metal than bezels, this type of diamond ring setting uses a combination of prongs and bars to secure the loose diamond. The bar setting is a popular choice among active brides who like the look of prongs but need something more resilient. Channel Setting: A popular choice for wedding bands and everyday accent rings, channel settings mount smaller diamonds into a band, keeping the stones flush with the metal. The sides of the band hold the diamonds in place without the use of bars or prongs. The smooth, polished style of channel settings makes them ideal for those with active lifestyles. One drawback is that the diamonds aren’t displayed as prominently. The channel setting is sometimes combined with prong settings in the same ring. Flush Setting: A smooth, secure option for mounting a loose diamond, the flush setting offers extra protection and doesn’t interfere with active lifestyles. A small hole is created for the diamond within a metal band; the stone is nestled within and does not rise above the band. This contemporary setting offers the smoothness of channel settings, but highlights the diamond a bit more. Pave Settings: For a truly elegant and brilliant diamond engagement ring, the increasingly popular pave setting covers the entire surface of the mount with diamonds. Each stone is discreetly secured with very thin prongs, minimizing the appearance of the underlying metal band and creating the illusion of freestanding, encrusted diamonds. This type of setting can potentially be very costly, although some money can be saved by using lesser-quality stones to coat the setting. Tension Setting: In this contemporary diamond engagement ring setting, only the band is used to secure the diamond. The stone is nestled into small grooves carved into the metal, creating a “floating” effect. This costly setting requires custom sizing, as the band cannot be resized without loosening the band’s “grip” on the diamond. Cluster Setting: Many of today’s engagement rings and diamond jewelry settings combine multiple stones, such as a diamond solitaire flanked by sapphires or emeralds. A cluster setting handsomely presents a group of gems in a custom design. A popular choice for those shopping on a budget, this style arranges several smaller stones together to convey the illusion of a larger diamond without the cost. Invisible Setting: This contemporary style secures the loose diamond to the band with a discreet mounting style, so the stone appears to be suspended in mid-air. Offering the look of a tension setting, the invisible setting is more durable and can be resized without worries of loosening the stone. For brides who can’t settle on just one setting choice for their diamond engagement ring, many custom jewelers offer varied settings that combine two or more different mounting styles in one ring. At Brilliance, we offer a wide selection of diamond rings with a range of settings to complement different cuts, hand types, activity levels, and style preferences. For those who prefer to craft their own unique showcase for their diamond, we also offer custom jewelry design.